You have probably heard of the many ginger health benefits or recognized its distinctly pungent, sweet-spicy flavor and aroma in many dishes. However, this Asian root has long been an important culinary, medicinal, cultural, and economic herb that has many uses all around the world. The medicinal uses of ginger have earned it a place among the most healing herbs around the world, with a long history of traditional applications. Ginger is most effective against nausea and vomiting, and it is also an anti-inflammatory agent and pain reliever. 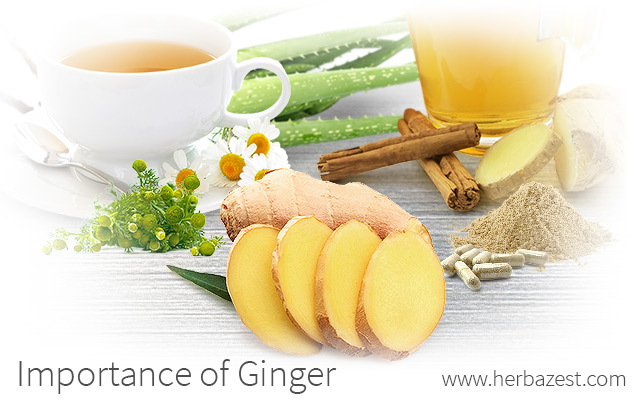 Ginger properties increase exponentially when blended with other herbs, such as chamomile, which is often used to treat upset stomach and other gastrointestinal issues, but whose attributed antiemetic effects appear to be mild in comparison to ginger. However, in a hot infusion, chamomile can add its soothing properties to ginger's well-known anti-nausea action, reportedly more effective than dimenhydrinate in reducing motion sickness and pregnancy-related nausea. Aloe is another important herb that is useful in treating inflammation, though the way it is used differs greatly from the use of ginger for the same purpose. When using ginger for inflammation, the herb is best consumed orally to relieve headaches, migraines, and arthritis pain, while aloe is applied topically to treat skin conditions. Though ginger has been thought to have some skin-conditioning effects, aloe vera has been shown to be more effective than hydrocortisone creams. However, the gastroprotective action of aloe, popularly consumed as a juice to soothe the gastrointestinal discomfort caused by gastritis and allow bowel movements, may be used as a complement when taking ginger for upset stomach. Ginger has great culinary importance all around the world, as it is the most commonly-consumed dietary condiment. Powdered or ground ginger is widely used as a food additive and flavoring agent, and eating fresh, raw ginger is arguably the most popular way of consuming this herb around the world, but the Asian root can also be found pickled, preserved, crystallized, or candied. Dried ginger is most often found powdered, and added to both savory and sweet dishes, as well as to pastries, such as gingerbread gingerbread cookies, cakes, and curry mixes. Ginger is an important economic crop that is commercially produced in South and Southeast Asia, tropical parts of Africa and Latin America, and the Caribbean. While fresh ginger is mostly consumed in Asia, there has been an increasing demand for ginger in North America and Western Europe. In 2000 alone, the United States imported approximately 19,000 metric tons of ginger. China and Thailand are the two greatest producers of ginger; however, the majority of ginger root marketed in the United States comes from Hawaii and the Fiji Islands. As a spice, ginger is an integral part of many world cultures. Its distinct aroma and sweet-spicy flavor are considered essential in many Asian dishes. Moreover, ginger is a common ingredient in Indian curry and many holiday treats, including the quintessential gingerbread house. Ginger has also played an important cultural role in folk medicine. It is believed that ginger has been produced in Asia for more than 5,000 years to treat many common ailments, including nausea, vomiting, pain, and inflammation. Modern science has confirmed many of ginger's medicinal uses and today, many healthcare professionals recommend the use of ginger as a household remedy. As such, ginger supplements play an important role in herbalism, as well as in the pharmaceutical industry. Besides ginger's importance in the food and pharmaceutical industries, it is also used in the cosmetic industry and is added to perfumes, lotions, and balms as a fragrance ingredient and skin-conditioning agent. Because of its many uses and health benefits, it is clear that ginger deserves a place of honor among the spices with great culinary, economic, and social significance all around the world.